With our Patented VisiBallistics™ technology, Survival Armor® now gives the decision makers and users of personal body armor peace of mind. We put the ability to inspect the vest in your hands where it belongs. Officers can clearly see what they are buying and how armor stands up to daily wear without removing the vest from service. Through extensive research and field trials, Survival Armor® has created a strapping system like no other! Its patented ergonomically shaped shoulder straps and reversible load distributing shaped side straps give the officer the ultimate choice in comfort. The unique shape of our reversible load distributing strapping system gives the officer added comfort while holding the vest in its correct position. 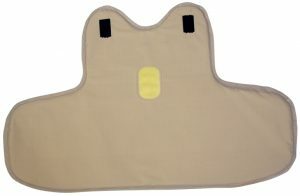 This also provides the choice of either 2” or 4” attachments to the front of the vest. The reversible load distributing strapping system, when pulled snug, elongates the REVOLUTIONARY shaped strap to distribute the weight of the vest over the lumbar area.